A couple of weeks ago our Landlord was over trimming some vines with his ladder (we didn't have a tall enough one). He noticed Nathan playing in the flower beds with his little trucks and digging. 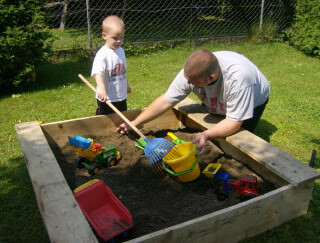 He commented that Nathan needed a sandbox. Danny said that we almost bought him one for his birthday but decided on something else. 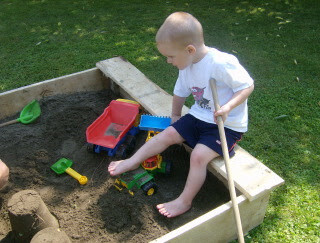 When the vines were trimmed our Landlord left and was back within the hour.... with a homemade sandbox! He went and screwed some boards together and VIOLA-a sandbox! He also brough some sand a few days later and his wife bough Nathan a 'starter' kit with a bucket, shovel, rake, etc. It was such a sweet and thoughtful act. Anytime someone takes an interest in my kids... well, it touches my heart. ps- I won't ask you who you think might've had more fun ;) Hahaha!